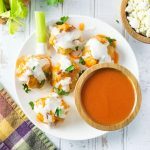 These tender buffalo chicken meatballs are a fantastic party appetizer or a great twist on the classic meatball sub. Topped with an effortless buffalo sauce, these will be gone in no time! I love parties. Well, to be more accurate, I love party appetizers. Mingling with other people and making pointless small talk is just a necessary evil I must endure to enjoy a great spread of hor d’oeuvres. After all, if we truly enjoyed other people’s company, would we really need mouthwatering appetizers to bribe them to hang out with us? Well, fear not, these buffalo chicken meatballs will get even the most recluse introvert to show up time and time again! Buffalo chicken meatballs wrap up all of the classic flavors of traditional buffalo chicken wings in each hearty little meatball. 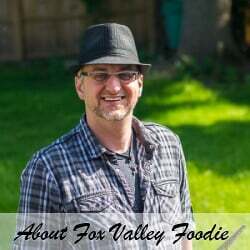 Finely diced celery and onion provide a nice contrast in texture to the tender ground chicken, while each meatball is infused with Franks RedHot Sauce (affiliate link) for added buffalo wing flavor. It is important to finely dice the vegetables, you do not want large chunks. When chopped finely, they will blend in with the meatball rather than being distracting when bitten into. The key to making great meatballs is to avoid overworking the meat. The less the meat with worked, the more tender it will be. I also like using white bread as a binder rather than breadcrumbs to make my meatballs even more tender. Simply let the bread fully soak in liquid for 10 minutes, until softened and can easily be dispersed into the meat mixture. Check out my How to Make Meatballs guide for more tips! The easiest way to cook your meatballs in a 350-degree oven for approximately 25 minutes. Since you are working with raw chicken, it is important to have the meatballs reach 165 degrees to ensure they are fully cooked. I often like finishing my meatballs under the broiler when they are getting close to being done cooking. The broiler adds additional texture and color to the meatballs. Buffalo sauce is exceedingly simple to make. A classic buffalo sauce combines melted butter with Franks RedHot Sauce. Personally, I like adding just a touch of Worcestershire sauce as well for an added layer of flavor. As soon as the ingredients are stirred together, the sauce is ready to use. Slow cooker meatballs are always popular. You can certainly make buffalo chicken meatballs in your slow cooker, but I recommend cooking them first in the oven and then keeping them warm in the slow cooker when serving. Chicken meatballs release rendered chicken fat while cooking, which will look unappetizing to your guests if left in a slow cooker. However, when baked in the oven, the meatballs can easily be added to the slow cooker after cooking, leaving the unappetizing yellowish rendered fat behind on the baking pan. 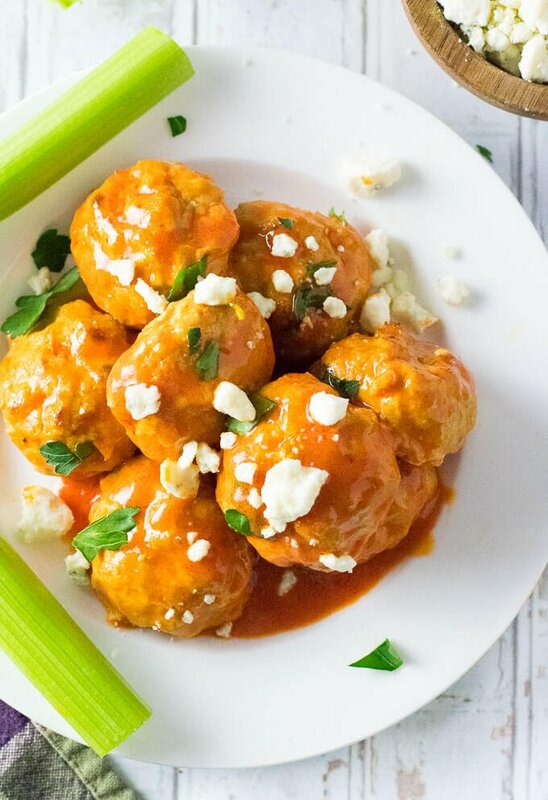 I recommend tossing the buffalo chicken meatballs in buffalo sauce and serving them with blue cheese on the side. If you wish to offer them as a stand-alone party appetizer, cocktail meatballs always make a great hor d’oeuvre. Otherwise, they also make a phenomenal lunch when added to a sub roll with blue cheese dressing and blue cheese crumbles. If you want more meatball appetizers, check out my BBQ meatballs as well! 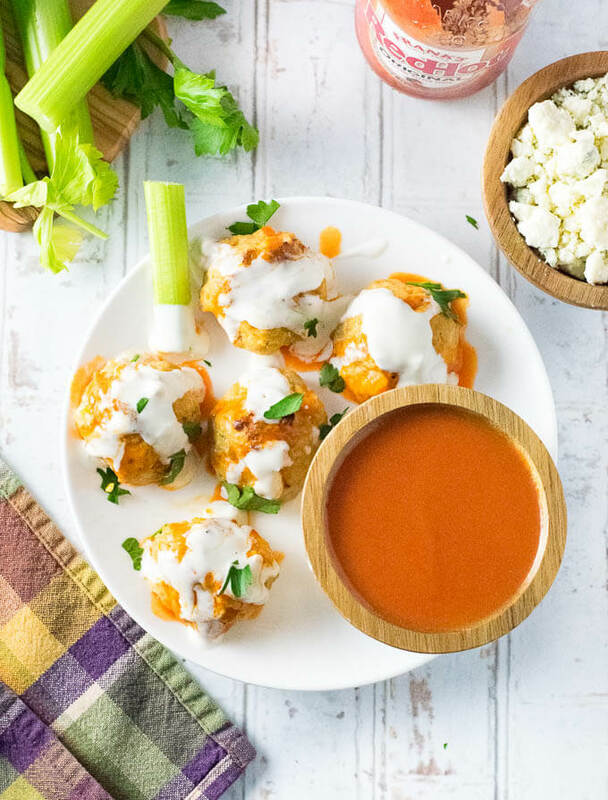 These tender buffalo chicken meatballs are topped with an effortless buffalo sauce, making them a fantastic party appetizer or a phenomenal meatball sub. Gently tear or chop bread slices into cubes and add to a dish with milk and hot sauce. Ensure bread is evenly saturated with liquid and let sit for 10 minutes while preparing remaining ingredients. Place meatballs in the oven for 25-30 minutes, or until internal temperature reaches 165 degrees. Optionally: For added texture and color, you can finish cooking meatballs under the broiler. When meatballs have finished cooking, toss them in buffalo sauce and serve with blue cheese dressing on the side. Melt butter and combine with hot sauce and Worcestershire. Tip: It is easiest to form meatballs with wet hands. 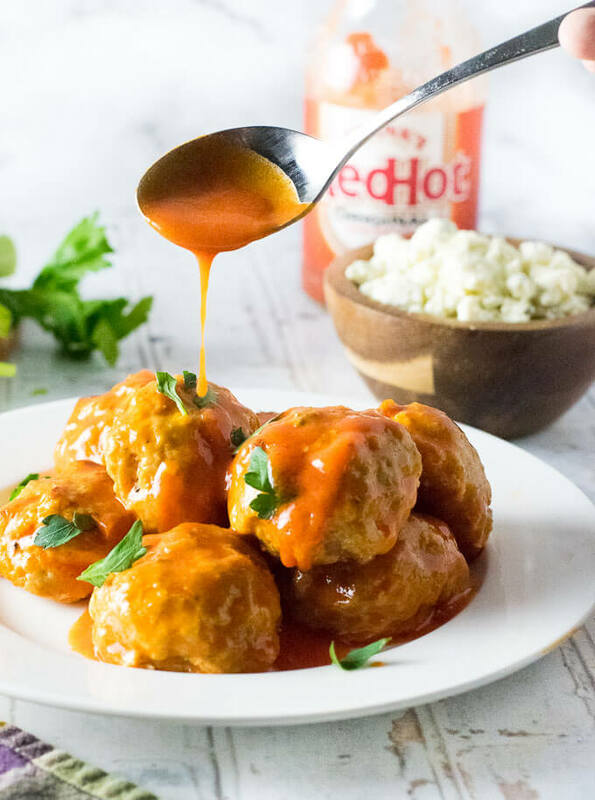 These buffalo chicken meatballs make fantastic meatball subs! IF YOU LIKED THIS RECIPE check out my Beer Cheese Dip as well! 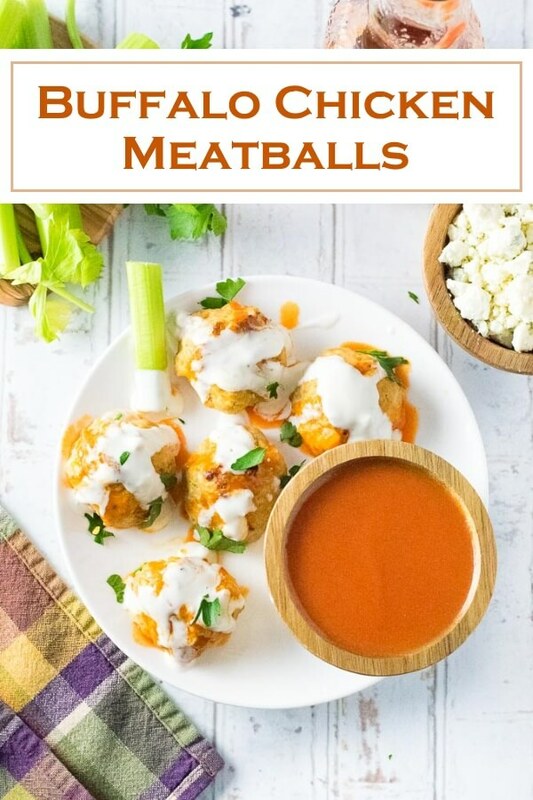 If you enjoyed this Buffalo Chicken Meatballs recipe then you should probably like me on Facebook and follow me on Pinterest too. That’s what I would do at least, and if you are willing to take my advice on the food you put into your body you should probably follow my advice on that too.